← One Month till Everyday Witch Tarot!!! 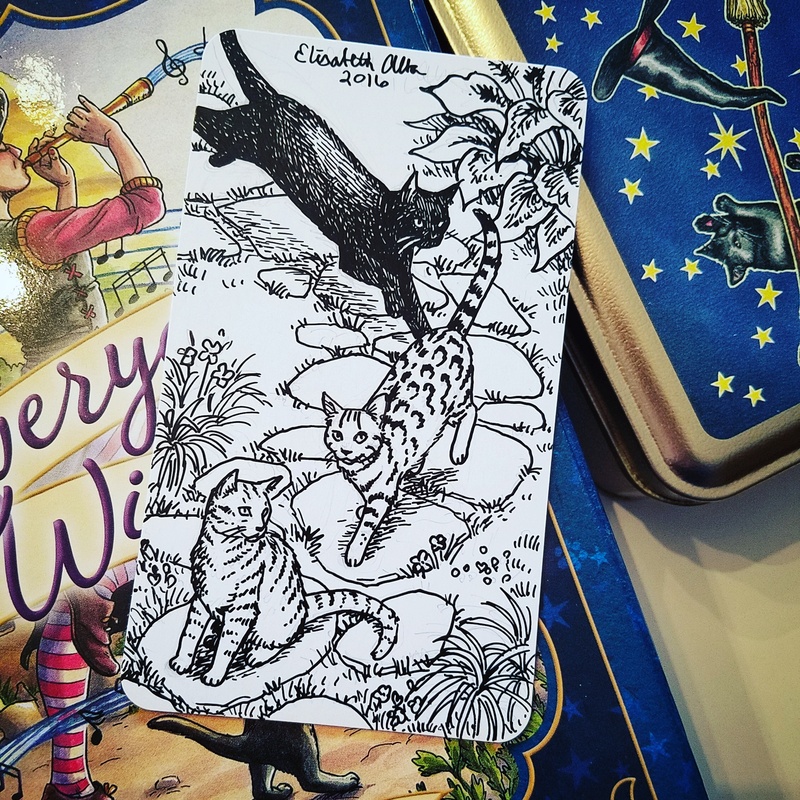 Deborah Blake and I were thrilled to find out that the Everyday Witch Tarot was coming out EARLY. How often does that happen?? It’s been out a week already and it wasn’t supposed to be released till January 8th! 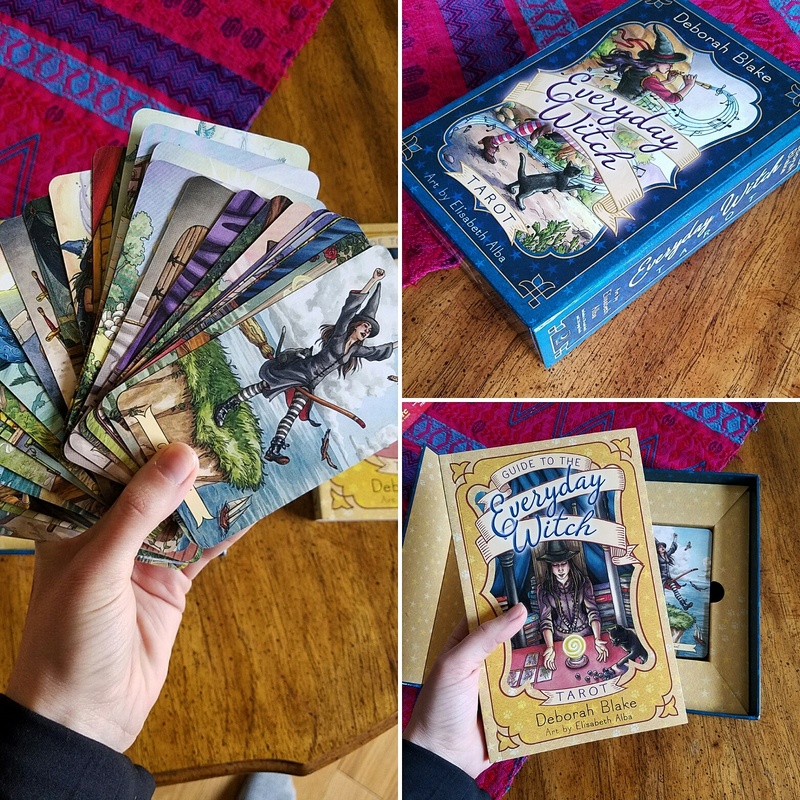 So the deck is now available via Amazon, Llewellyn, and in other stores too! We’ve already got some great reviews on Amazon. Here’s a photo of it in my hands for the first time… so pretty! I love the packaging. As you can see, there have been a number of cat requests! I’m having a lot of fun with them. Always love a chance to work in black and white. 2017 has started off well so far! I’m also in the midst of working on new illustrations for Llewellyn’s 2018 Magical Almanac. And I just found out Scott and I were again selected to participate in the Gen Con Art Show in August. It’s the 50th anniversary so it should be a good time for sure! Did I ever mention my Redbubble store? 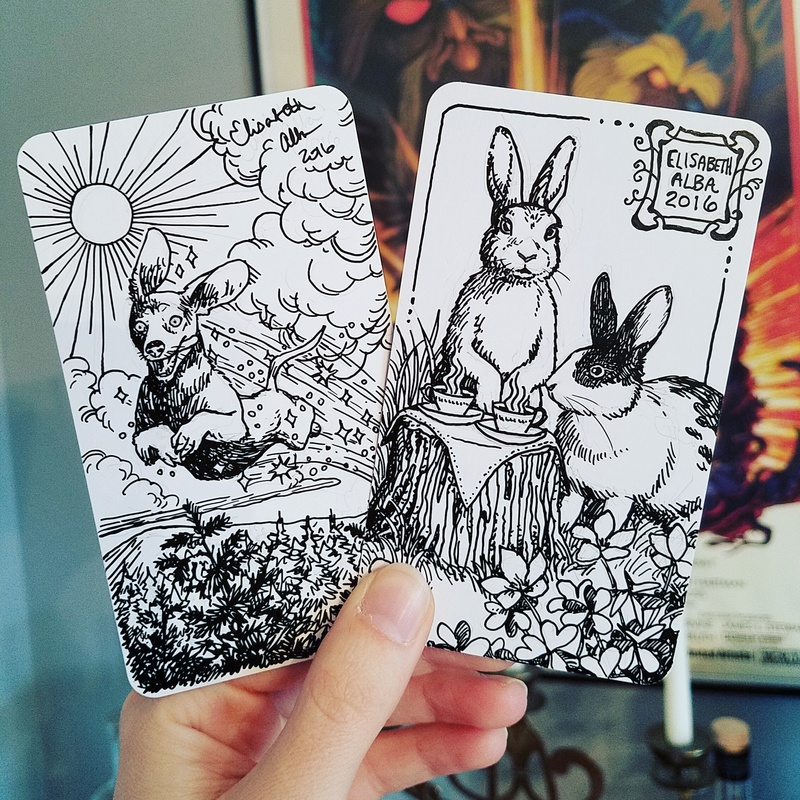 You can now purchase some pretty cool merchandise (shirts, journals, phone cases, pillows…) with my artwork on it, including images from the Everyday Witch Tarot. Check it out at www.redbubble.com/people/elisabethalba! 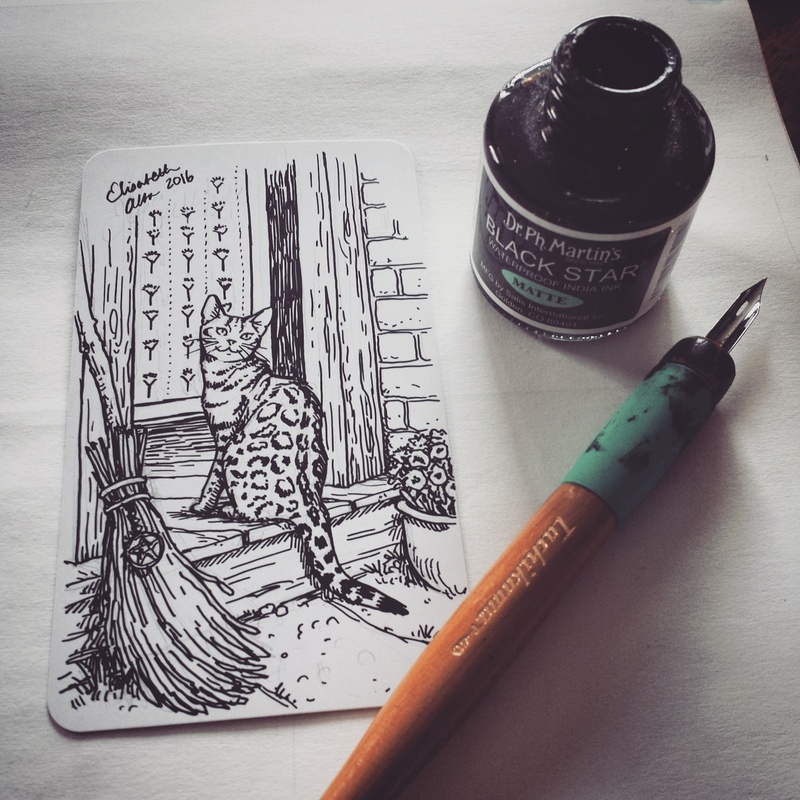 This entry was posted in sketches, tarot and tagged black and white, cats, deborah blake, everyday witch tarot, llewellyn, llewellyn worldwide, sketches. Bookmark the permalink. 7 Responses to Everyday Witch Tarot is HERE!!! I adore your sketches! The cats are wonderful. Especially the bengals! I love the deck and did a very positive walkthrough and review on my youtube channel – https://youtu.be/Hw6_WrrnrDc I like the storage tin shown in one of your pics. Is that available somewhere? Beautiful work, Elizabeth. Thank you for making such a lovely deck. Hi Lauri, thank you so much!!! The tin was made specifically for a special edition of the deck that I created, but it sold out. If there is enough interest I might have another tin made with a different image though. Hi Elisabeth, I saw your deck on Aeclectic a few days ago, loved it! I immediately ordered a set, and it is awesome! Such a lovely, charming deck! And I love the box and the book, too, really nice! Thanks for all your work on the deck, it is going to be one of my main decks, maybe even my main one. Hello. 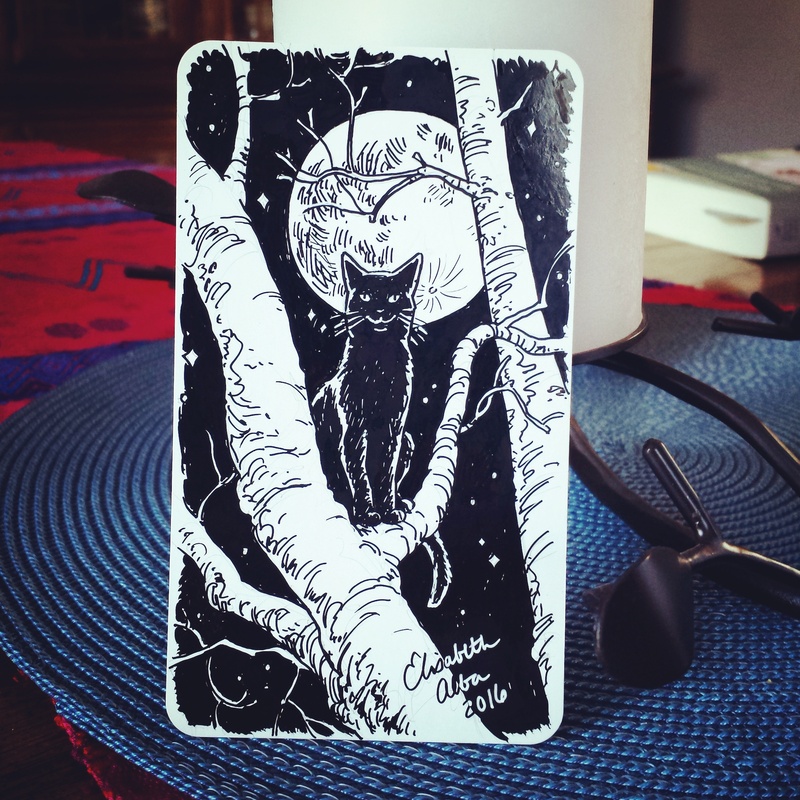 I love your everyday witch tarot sketches. I was wondering though why all the women are young? I am a everyday woman in my 50′s but spunky too. A lot of baby boomers are out there doing many things. I love this deck but wondered why it did not reflect all ages and colours? Hi Anne, I’m glad you love the deck! I wish there was more diversity too. As the artist of the deck, I was given descriptions and just drew based on what I was given. It was my first job with Llewellyn and didn’t know how much leeway I could have so I wanted to do my best with what I was given. If I have the opportunity again, I would like to try to have more diversity whether it’s in the descriptions or not!